After another great Silverstone Grand Prix that concluded with Lewis Hamilton, Nico Rosberg and Max Verstappen on the podium collecting the trophies we wanted to bring you the story behind the creation of the trophies that were awarded this year. The company that was lucky enough to design and create the trophies for this years British Grand Prix was Kent based trophy company Aford Awards. The trophy makers worked hard for nearly four months on designing and manufacturing the trophies to make them fit for the world's top racers. The process wasn't an easy one, with the brief provided stating that the trophy needed to resemble a cup and be as large as possible, as long as it fitted with the F1 guidelines. There are strict rules within F1 regarding branding on trophies, however, Silverstone were eager to incorporate their well-known logo into the overall design of the trophy. There was quite a lot of pressure on Aford Awards to come up with something special for this year's British Grand Prix as many of the drivers have criticised the quality of the trophies being awarded over the last few years. Lewis Hamilton famously voiced criticism of the 2014 British Grand Prix version, labelling it a "plastic red thing". Knowing that the drivers prefer having trophies of a more traditional gold, silver, and bronze Silverstone wanted this years trophies to reflect this. Working on the brief provided by Silverstone, Aford Awards created three designs for them to choose from. Silverstone opted for the "lightning bolt" design for the trophies which cleverly incorporated the iconic Silverstone lightning bolts on a highly polished metal base. Once the final designs were given the go-ahead Aford Awards got to work on making the prototypes. 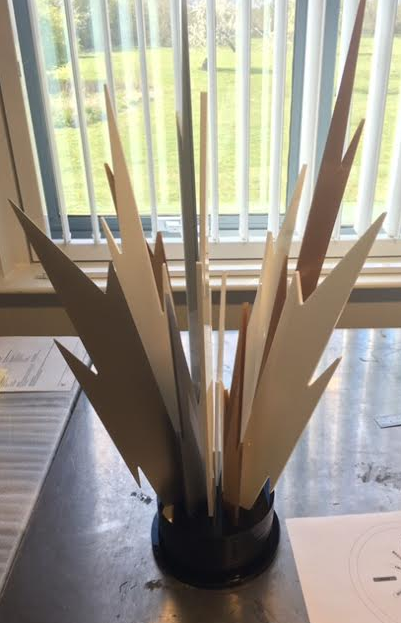 Getting to the point of making the prototype was exciting, giving Aford Awards the ability to see their hard work take shape. The prototype phase was important to ensure that the trophies adhered to F1 guidelines. The prototype was made of acrylic and sent to Silverstone, sadly there was a problem with the transportation and the prototype snapped. Fortunately, Silverstone were still able to check the prototype met the requirements and the final trophies were ready to be made. The initial step in manufacturing the trophies was to cut the metal pieces to shape out of the 5mm metal sheet used. This metal was used as it was perfect to be cut and gave the trophy the weight and strength needed to support the height. With four trophies to make there were a lot of pieces to cut out. Once all the pieces had been made they were sent to the anodising team to be coloured. 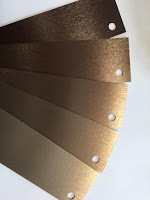 Anodising is the process of giving a metal a colour, and it can be nearly any colour you could imagine. 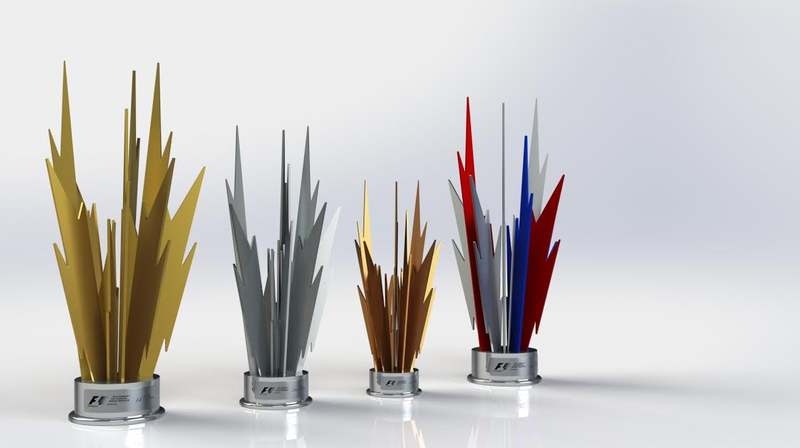 This process was perfect in creating the gold and silver for the drivers' trophies and red white and blue of the constructors' trophy. However, choosing the colour of the bronze trophy became a bit more challenging, with some of the bronze colour options looking almost brown. Although the dark colour looked good alongside the other trophies, it became obvious that on television the bronze trophy would look terrible! After looking at five different shades of bronze, Aford Awards' managing director Jon Ford chose a lighter shade of bronze. 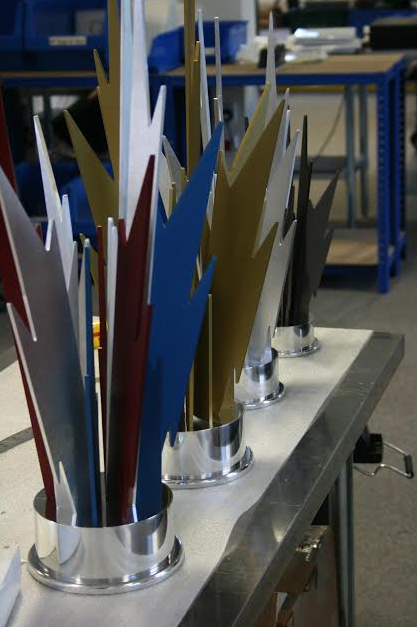 With the lightning pieces coloured and ready for each trophy they were secured to a highly polished metal base and prepared for delivery. With the process starting in mid March and the final trophies being delivered on 5th July, it was a lot of hard work, but what an amazing experience! Aford Awards were honored to be part of the 2016 British Grand Prix, with Jon Ford saying "they are probably the most-expensive trophies we have ever made but also the most prestigious."